Tony. Minasian. From there to Tonian is no stretch. Add percussionist Brad Dutz, cellist Chris Votek and clarinet man Brian Walsh. 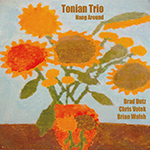 Voilà, an impromptu Tonian Trio album as recorded by Mr. Tony Minasian for Hang Around. It's his second purist recording after Comparing Sticks. On the purely percussive precursor, Tony gave us all the splendidly stiff Johnny Cash salute. Of course he didn't aim that at us. By inference, it just aims at the so-called high-resolution movement and its dishonest "CDs aren't enough" priesthood. How did Tony stick it to 'em with Sticks? Our man had the temerity to record to "lame" 16-bit 44.1kHz at a whopping 50dB of dynamic range with none of the usual mastering shenanigans. Proof positive that Redbook is capable of infinitely more than what the vast majority of 'be loud, be proud' recordings demonstrate with their dull dynamic compression. If all recording and mastering studios did like Tony—refuse to choke the music to virtual death by exploiting the RedBook spec for what it is innately capable of—the entire hi-rez movement wouldn't have a leg to stand on. Not that it really has much now. Its catalogue is far too puny to matter. Meanwhile Comparing Sticks showed how straight CD-quality recordings done right are all we could really want if the full dynamic range available to be encoded actually was. It's not the format's fault if most decide to drive it with a tank mostly empty. That means hitting the road when one is down to less than ten decibels of recorded dynamic range. No wonder that 99.9% of all recordings never even see much less hit the limits of CD-quality resolution. Yet the hi-rez priests champion a new format as though the old one was broken. Hang Around knows better; again. It behaves and sounds like a very good hence rare high-resolution effort but uses an ordinary CD carrier. On it three very experienced musical journey men improvise freely while Tony did the absolute minimum behind the scenes – probably just gain matching three microphones. Of course the liner notes thanking Ken Opalk for the design and machining of equipment mods to get the sound they wanted suggest that there was just a bit more to it than capturing some ad-hoc jamming on standard equipment. The jamming here is characterized by two instruments which essentially only play one note at a time each. That eliminates the type harmonies a guitar or keyboard contribute traditionally. With its added percussion, Hang Around is thus mostly an exercise in rhythmic textures surrounding simple melodic snippets conjured up in the moment. Musically, it's thus more lightweight and in contrast to the unusually high sonic quality. In short, I'd listen to Hang Around more to show off my system's audiophile aspects than to enchant someone with advanced musical magic. But Tony Minasian promises there's more coming down this pike. Let's give him some time to fully develop his particular recipe. Or as Tony put it, "I'm capable of recording in DSD and PCM up to 192kHz and tried both but could get no better results than at 16/44.1 to copy to the consumer. In my opinion, bigger file sizes or DSD would have just been a waste of space. Why I thanked Ken is that he was one of my early customers and a machinist who became a good friend. He helped me with some of the upgrades I wanted for my microphones and speakers. That involved a lot of trial and error and I couldn't have financially committed to all the machine-shop tooling without Ken's help." The moral of this story? 16-bit/44.1kHz can sound amazing when someone cares deeply to make it so. Tony's two albums make that point.